Another Heart Shaped Box as of November 30, 2013, a photo by randubnick on Flickr. Quick Little Menurkey, a photo by randubnick on Flickr. Menurkey a video by randubnick on Flickr. I made this little video animation last night on my iPad using the Brushes app. (The iPad version of the Brushes app captures a stroke-by-stroke video as you draw.) 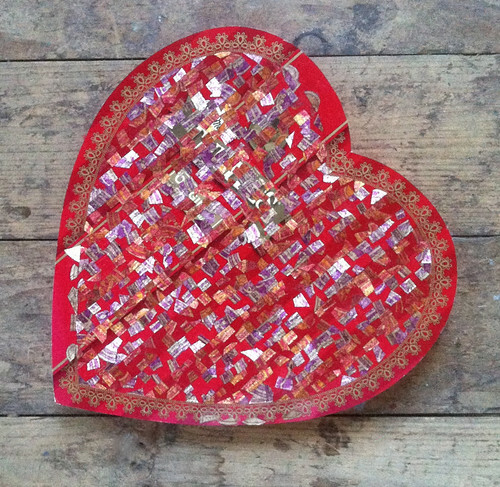 I will use it to send out on-lin greetings for Thanksgiving and Hanukkah, which overlap this year. Quick Little Menorah, a photo by randubnick on Flickr. This is the first night of Hanukkah, and Thanksgiving is tomorrow. So today I spent a lot of time rushing around doing errands, but late this afternoon I took a little time to work on a little project on my iPad, a Hanukkah and Thanksgiving animation. (The Brushes app on the iPad captures a stroke-by-stroke video as you draw.) 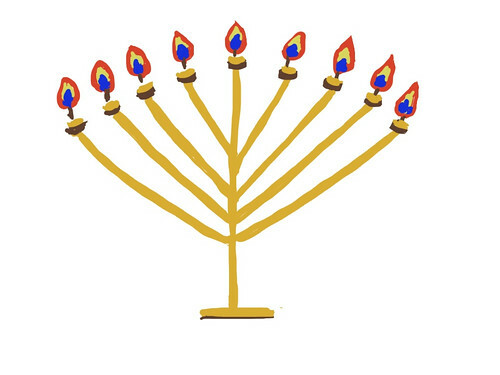 The first part of the project was to draw a menorah. (Maybe you can guess where this is going.) So I did this quick sketch with the Brushes app. To be continued. . . . Composition with Peppers (Posterized), a photo by randubnick on Flickr. 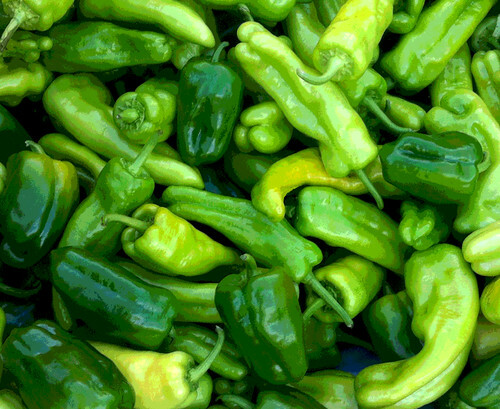 Last night I posted a photo of peppers (cubanelles and green peppers). (I took the original photo in early October, during pick-up day at the Food Project, our local CSA.) Tonight I opened the jpeg in Painter I2. I was thinking of cropping the image because the shape of one of the peppers was distracting. I tried a few closeup crops, but then decided to go a different way. I used digital pastel to modify the shape of that one distracting cubanelle. Then I posterized the image and really liked the result, so here it is. I might use this one for the food blog. . . . Composition with Peppers, a photo by randubnick on Flickr. I plan to start another painting later in the week, but meanwhile I am catching up with editing photos. Here's one that I took back on October 3, on pickup day for The Food Project, which is our CSA, over at Long Hill Gardens. These peppers were in a great big bin. I liked the way they looked, so I took a picture. Today I did a little retouching in iPhoto and then cropped the original to get this composition. Oak Leaves (Pen and Ink Exercise), a photo by randubnick on Flickr. Here is another little drawing that I did this afternoon with pen and ink, and the last of the 3.5 inch Zentangle tiles that came with my new set of pens. I was thinking about oak leaves, creating a random pattern on the ground. The Translucence of Leeks (Pen and Ink Exercise), a photo by randubnick on Flickr. 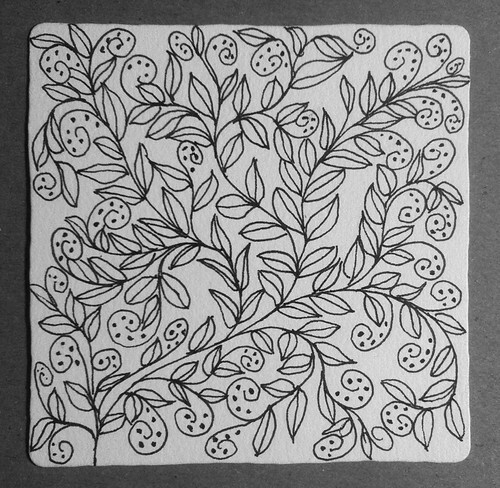 Here's another little pen-and-ink exercise, done on a 3.5 inch square "Zentangle tile" that came with my new set of pens. I did this drawing late this afternoon, just before I started cooking dinner, which might be why I came up with design elements inspired by leeks (which I actually used to cook dinner last night). The title refers not only to the fact that leeks become translucent when sautéed, but also to the fact that the lines began to cross as I drew so I decided to make the leeks translucent. Slices and Seeds (Pen and Ink Exercise), a photo by randubnick on Flickr. Here is another pen-and-ink exercise that I did today, using my new pens. 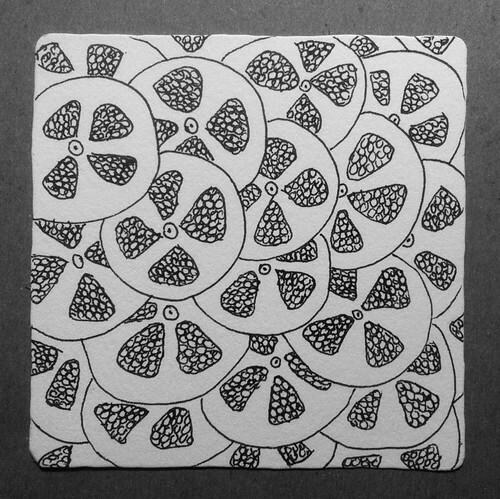 This is a small drawing, 3.5 inches square, drawn on one of the Zentangle tiles that came with the pens. I knew I wanted to draw a pattern, and started drawing circles. I drew this late this afternoon and I guess I was thinking about making dinner, because the shapes started to look like sliced tomatoes, so I went with that and added seeds. But the shapes could also be jalapeño slices, or maybe even pomegranates. Anyway, it was fun to draw, and good practice. Lines, Vines, and Dots (Pen and Ink Exercise), a photo by randubnick on Flickr. Here is another pen-and-ink that I did late this afternoon with my new pens. This drawing is 3.5 inches x 3.5 inches. 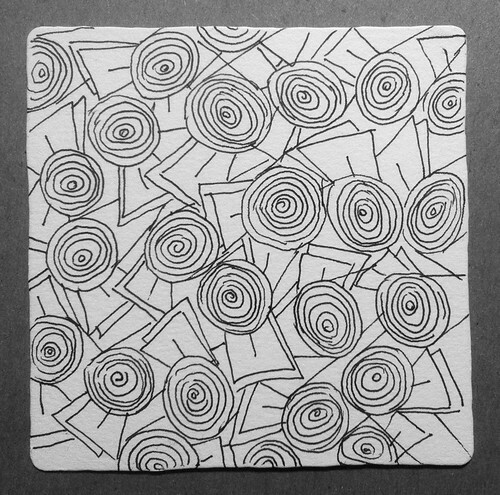 (I used a "Zentangle" tile that came with the pens.) 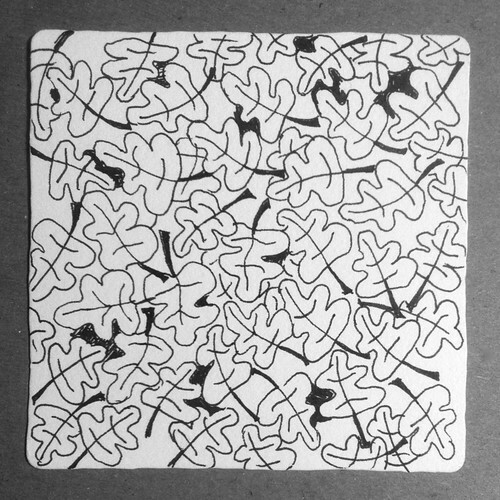 I am not sure it is a "Zentangle"; I just started drawing vines and leaves and let the drawing take me where it wanted to go. Lemon Lime (Pen and Ink Exercise), a photo by randubnick on Flickr. This is a little pen-and-ink exercise that I did tonight. I was curious about Zentangles so I read a little bit about it, and even bought a little kit with some new ink pens (micron pens with archival ink) and some little pieces of paper 3.5 inches square. Life has been pretty hectic, so my new "toy" has been gathering dust. But tonight I decided to try it out. I didn't really follow the steps for a Zentangle (subdividing the area with strings, etc.). 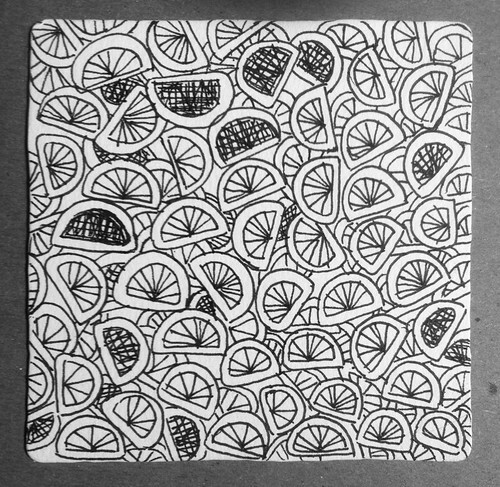 Instead I just invented this little pattern and started drawing on one of the little paper squares. (I was thinking about the fish I was going to cook in lime and orange juice, which is why the pattern I invented looks a little bit like citrus fruit wedges.) Anyway, whether or not this really a Zentangle, it was a good exercise and I am really happy with my new pens. 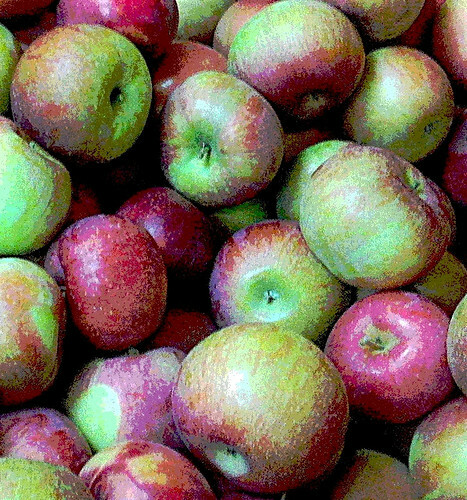 More Apples from Russell's (Posterized), a photo by randubnick on Flickr. Here's another image, also begun with a photo taken at Russell's Orchard in Ipswich, MA. There are huge bins full of apples, and I was photographing different kinds. Tonight I cropped this image from one of the photos, cropped it in iPhoto to get this composition, and then used Painter to posterize it. 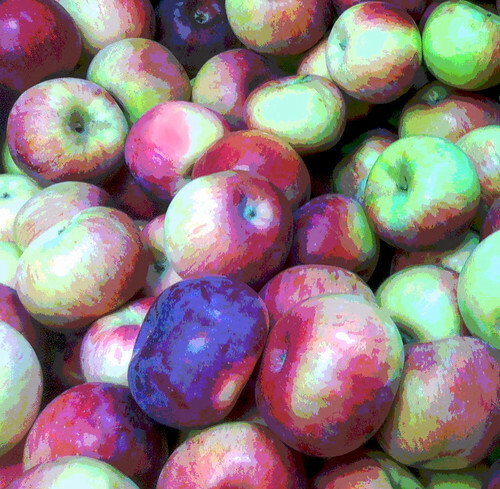 Apples at Russell's Orchard (Posterized Photo), a photo by randubnick on Flickr. For the past few days, I have been posting some photos taken at Crane's Beach on October 22. That day also included a stop at nearby Russell's Orchard (also in Ipswich, MA). Of course there were big bins of apples and I took some pictures. Tonight I cropped this image out of one of the original photos, and used Painter to posterize it. Crane's Beach Sand Dunes (Posterized), a photo by randubnick on Flickr. This is a posterized version of the image I published here yesterday: a digitally modified photo of the sand dunes at Crane's Beach (in Ipswich, MA). I used Painter to apply a posterizing effect. The posterizing is subtle, but it created some nice touches of pink and purple in the sky and in the sand. Crane's Beach Sand Dunes (Digitally Modified), a photo by randubnick on Flickr. 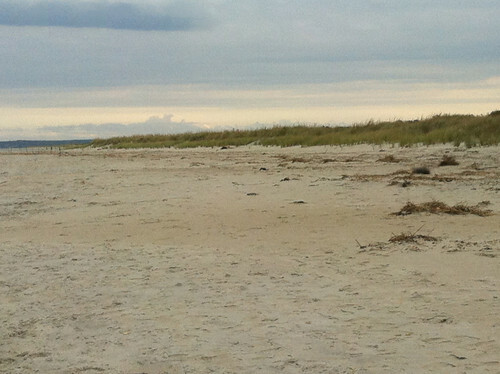 Here's another photo that I took during a walk on Crane's Beach (Ipswich, MA), late afternoon October 22. I liked this shot of the sand dunes, but the original photo was not ready for prime time. I used iPhoto to clean up some small bits of litter on the sand. Then I did some cut and paste in Painter to get rid of some bigger problems, something that looked like pieces of abandoned tire left in the sand. While I was at it, I decided to use cut and paste to move some clouds around, to adjust a distracting cloud formation that was exactly in the wrong place for the composition. I also created a posterized version of this image, which I plan to post here tomorrow. View of Castle Hill from Crane's Beach, a photo by randubnick on Flickr. 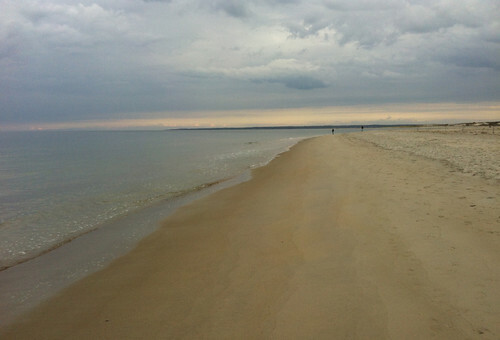 Here's another photo that I took during a walk on Crane's Beach in Ipswich, MA back on October 22. As you walk along the beach, the views of the ocean are wonderful. But if you look in the opposite direction, you can see Castle Hill, a huge estate now owned by the Trustees of the Reservation and open to the public for tours and special events. 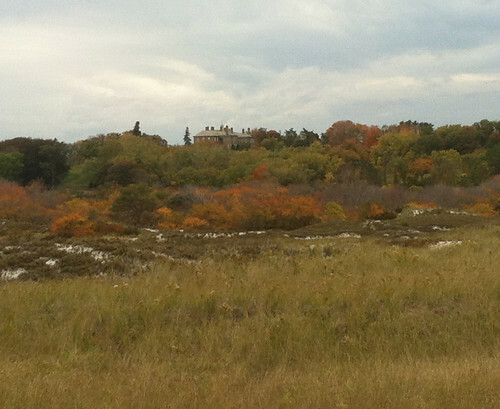 (You can see the mansion at Castle Hill in the distance in this photo.) I thought the colors and textures were interesting so I took this photo. Tonight I cropped it in iPhoto to get this composition. October Afternoon at Crane's Beach, a photo by randubnick on Flickr. Today I finally had a chance to look through some photos that I took back on October 22, during a late afternoon walk at Crane's Beach in Ipswich, MA. I think this is one of the best of the lot. The sky was overcast, which was disappointing for a beach outing, but great for photography. This was taken around 4 PM. I liked the light show in the sky, so I took this picture. Sometimes I try to avoid taking pictures of people when I photograph landscapes, but in this case, I think the human figures help provide a sense of the scale of the place. Menurkey (Turkey-Menorah), a photo by randubnick on Flickr. Pumpkin Dreidel, a photo by randubnick on Flickr. 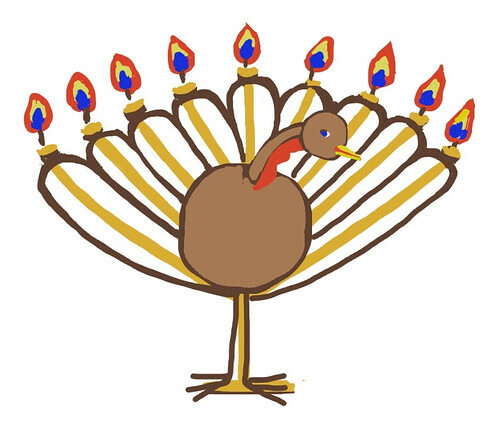 This year, Thanksgiving falls during Hanukkah. (The last time this happened was 125 years ago!) 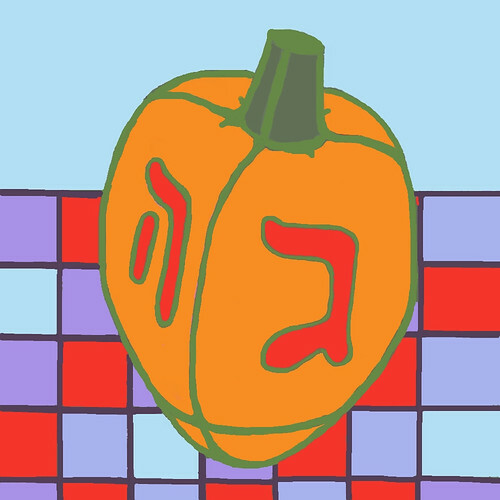 I was thinking about ideas for greeting cards this year, and my daughter suggested the idea of a pumpkin dreidel. I already had a digital painting of a dreidel that I created some time ago, so I opened it in Painter and used it to create this image. It makes me laugh! 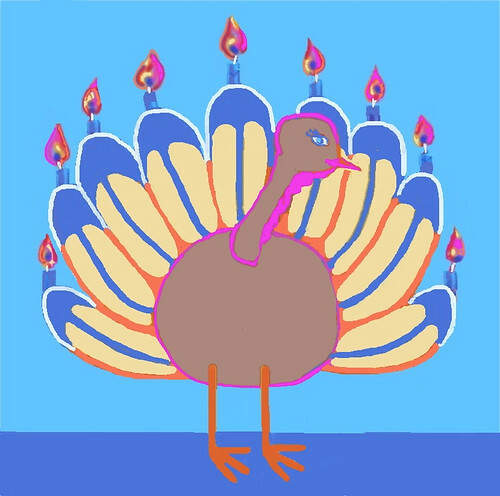 I did use it for a combination Thanksgiving and Hanukkah greeting card (on Zazzle) and people seem to like it. 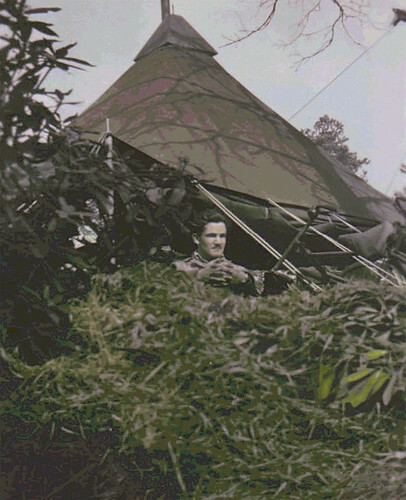 Dad in Foxhole (Posterized), a photo by randubnick on Flickr. This image began with a small snapshot (2 x 3 inches) that I came across this morning in my mom's photo album. She met my dad in 1943 in Pueblo, Colorado at a USO dance, and they got married a few months later, in April, shortly before he went overseas. While he was away, she kept a photo album with pictures of what was happening in Pueblo as well as the photos that he sent her, a number of them such as this one. This morning I used Painter to colorize and posterize the image. I don't know who took the original photo, but of course it was one of his army buddies. I don't know as much as I should about what he did during the war. Mostly I was told that he played the piano in the band (he did), which is what my folks said when I asked. And I don't know much about this photo. But on the back of the photo, in my father's handwriting, it says "March 4, 44" and "Me in my foxhole. Thinking of you." Maybe that's all I need to know. 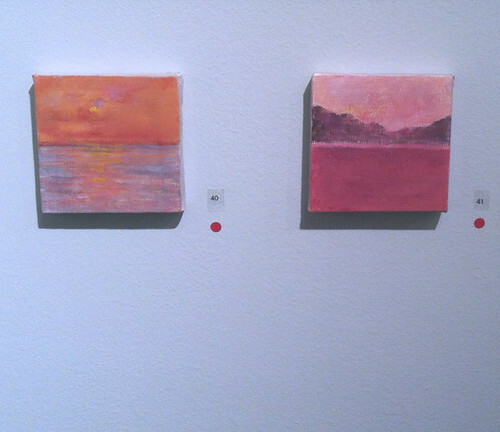 Two Mini-Paintings in the Gallery, a photo by randubnick on Flickr. Here are my two miniature oil bar paintings, on display in Porter Mill Gallery. 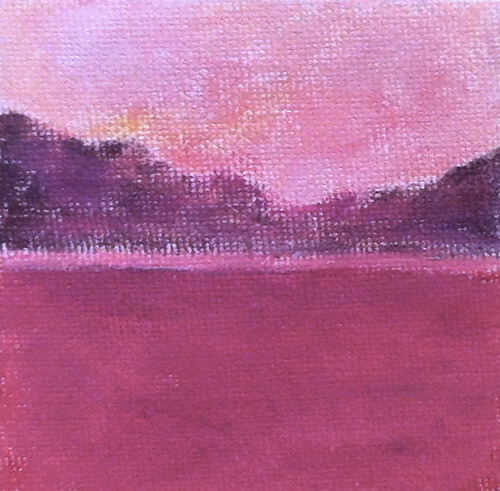 Each painting is only 3 inches square. The titles are "Golden Sunrise" and "Colorado", and both were painting from imagination. The photo was taken last Thursday at the opening reception for the "Small Works Show". I liked the way my paintings looked on the wall, so I took this picture. Colorado (Oil Bar Mini-Painting), a photo by randubnick on Flickr. Red Leaves (Oil Bar Painting), a photo by randubnick on Flickr. Here is the final version of my oil bar painting. I finally finished on October 23. In the end, I decided not to go with the one translucent leaf, so just put it back the way it was. Detail of Red Leaves (with Sealed Canvas), a photo by randubnick on Flickr. 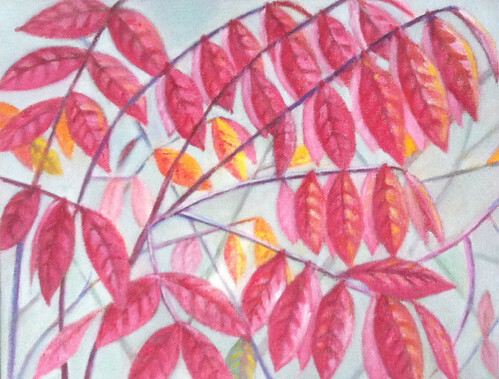 Here is a detail from my oil bar painting of red leaves. This was taken on October 21, when I started sealing the canvas (painting the edges). I decided on a gray-green edge. 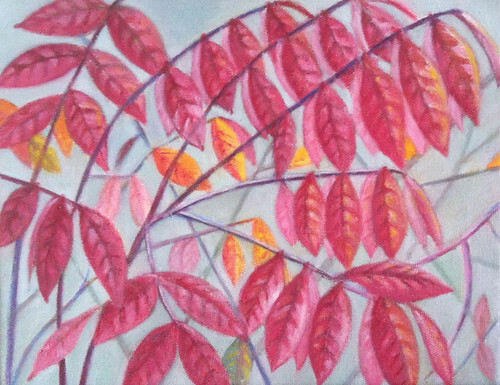 Almost done. . . .
Red Leaves (Oil Bar Painting as of October 22, 2013), a photo by randubnick on Flickr. 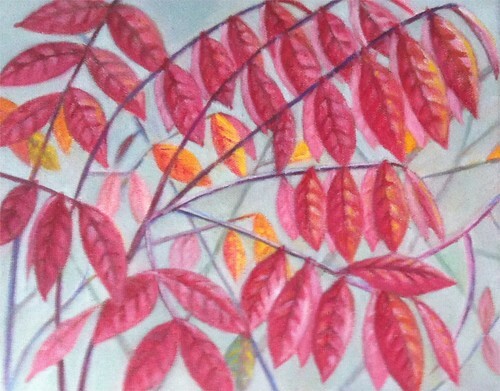 This is my oil bar painting of red leaves as it looked on October 22. I was almost done, but continuing to repaint and clean up lines. I was also in the process of sealing the edges of the canvas. 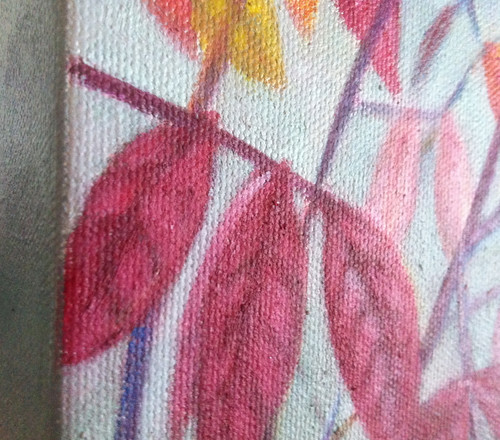 At the last minute, I decided to try to make one of the leaves translucent, as if overlapping one of the branches, as in the reference photo (posted here September 25). I liked the idea, but wasn't sure if I should keep it that way. . . .
Colorado (Mini-Painting as of October 21, 2013), a photo by randubnick on Flickr. Here is my miniature painting of Colorado as it looked on October 21st, when I added color to the foreground and sky. This is oil bar on a tiny canvas, only 3 inches by 3 inches. This is from imagination and memories of the Rocky Mountains in my home state. 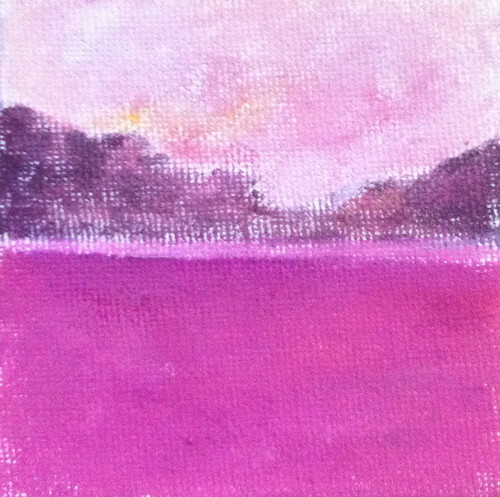 I have a stack of these small canvases in my studio, and it is fun to use the last few minutes of my painting sessions to work on them. Red Leaves (Oil Bar Painting as of October 21, 2013), a photo by randubnick on Flickr. This is my oil bar painting as it looked on October 21. At that point, it was almost finished. I was adding more light and trying to clean up any problems and mistakes. In fact I began sealing the edges of the canvas. 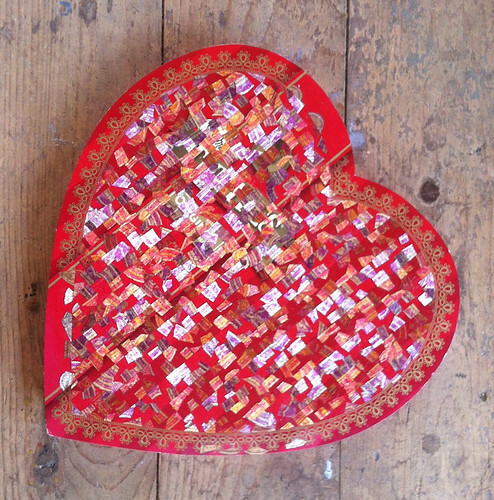 Just a little bit more to go. . . .
Another Heart Shaped Box as of November 1, 2013, a photo by randubnick on Flickr. 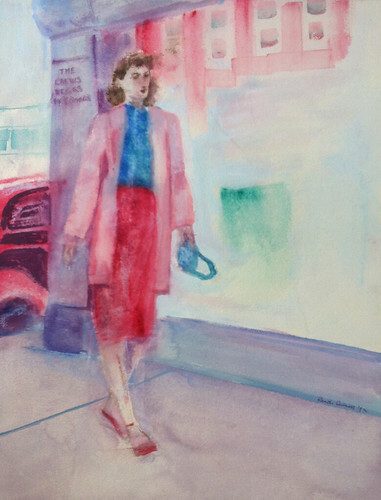 Mom Walking to Crews Beggs (Acrylic Water-Media), a photo by randubnick on Flickr. I did this painting of my mom back in 1992, using acrylics as water-media on paper. She died in 1984 and I found comfort in old photos of her. This got me started on a series of water media paintings based on old 1940s family photos. The particular photo that inspired this painting was taken by my very amazing uncle, Ike Fitterman (AKA Jay Phillips of Jay Phillips Photography Studio in Pueblo). My uncle's photo is a 1940s black and white, taken on Main Street in Pueblo, Colorado, in front of the Crews Beggs Department Store. That photo is still one of my favorite pictures of my mother. (I also created a colorized version of that photo which I posted on this site on April 25, 2005.) Just a few weeks ago, in early October, I was ransacking portfolios in my studio, looking for something else, and came across this painting. I thought I had posted this water media painting here previously, but no, I hadn't. So I decided to wait to post it until today, because my mom was born on November 2nd. Stone and Iron Gates (Color Version), a photo by randubnick on Flickr. Yesterday I posted a black and white version of this photo, trying to make it slightly scary for Halloween. This is what the scene really looked like when I took the photo back on October 5th. 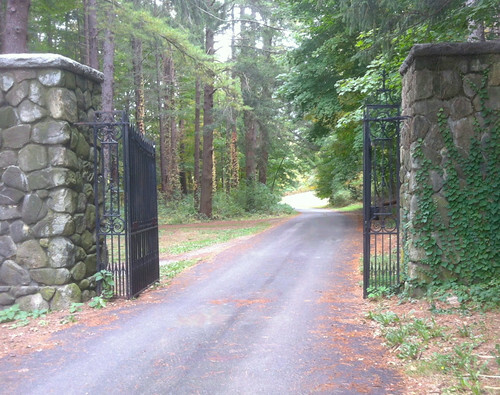 This beautiful gate is at one of the entrances to Bradley Palmer State Park, here in Topsfield, MA. This has been digitally edited in iPhoto to clean up some litter and then lightly posterized in Painter.